This week I spent on the beautiful island of Dominica in the caribbean sea. We traveled there by ferry from Guadeloupe and it is the second stop on our journey. 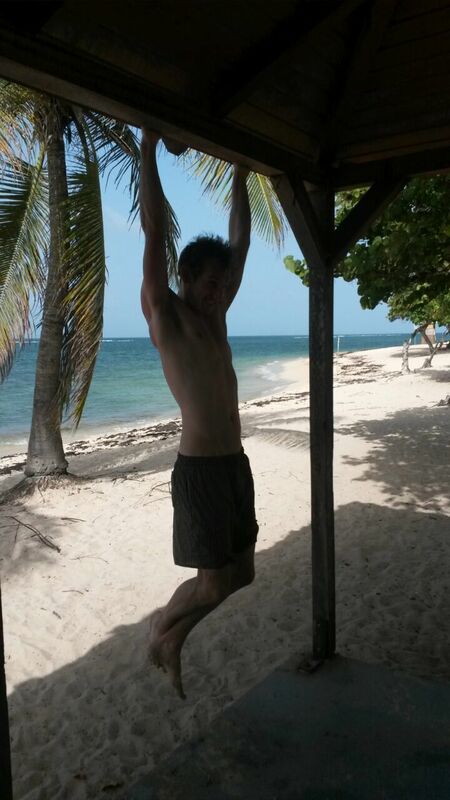 On Guadeloupe I found plenty of spots to do my exercises – on Dominica this was not so easy. The island is less developed and more natural, so finding places that are appropriate to do workouts are rare – there are no playgrounds, grasslands or even big parking spots. Most of the island is covered by rainforest or at least heavy vegetation. The first days we spent near Portsmouth where we had a small villa in the rainforest. It literally rained almost every hour, followed by hot sunshine what lead to high humidity. We had no air-conditioning in our house and it rained hard at night too – so getting a good night sleep was tough. The rest of the week we spent in Roseau, the capital city of Dominica. There, finding a spot for a workout was almost impossible – so I only did 2 of the 4 workouts this week and I had to repeat the week but it was not that bad as we did a lot of hiking, swimming and snorkeling so I got a lot of movement anyhow. Dominica was a great experience. It’s nature and wildlife was fascinating but also the people and how the they manage their life with the little things they have. They seemed to be happy with what they have, even compared to our standards it is not much. 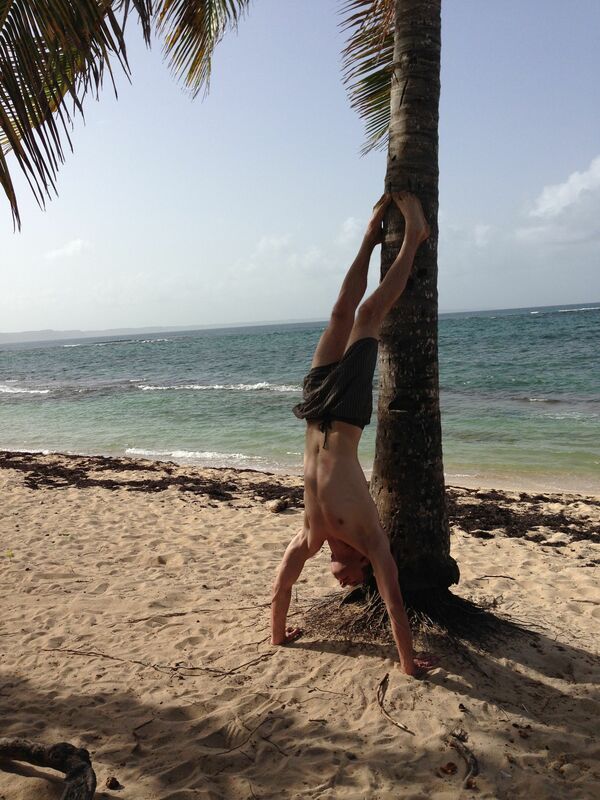 On Martinique – our last stop – doing the workouts was much easier and I completed the 6th week. We had two beautiful apartments in quiet habitations with nice pools, one in Le Prêcheur at the north side of the island and one in Le Diamant on the south side. The weather conditions were not that tropical, but still hot. As you don’t need any equipment it is easy to do your workouts. I just carried a thin yoga-mat but didn’t use it often as I worked out at the beach most of the time and the wet sand is much better than a mat 😉 The only problems are the pull-ups there I had to improvise. The Freeletics app works offline, only the coach needs an internet connection from time to time. I tried to do the workouts near wifi-hotspots, but even when this was not possible, the coach synchronized the workouts when I connected to the internet the next time. In tropical regions the hot weather might be odd, I did the workouts in the morning or evening, when the sun was not that intense. Also I trank almost 5 Liters of water every day. On the plus side: working out at a beach is amazing! I did the burpees near the water, so that some waves could reach me. It is great to get some cold refreshment during and after the exercises. Eating clean can also be a challenge, especially if you travel in a group of people. I did not always want to get an extra treatment and sometimes this would not even possible. I remember one night in Dominica when nothing where we could buy food was open except for a KFC restaurant – and we came from a six hours hike and where almost starving…on the other hand, on this island you can get a lot of fish and fresh fruits, but some things I eat at home with high protein level like curd was impossible to find. Overall, maintaining my workout routine was challenging but manageable during the holidays, and I would say it was even necessary. Three weeks is a long time and you lose a lot of progress when you take a break for this long. 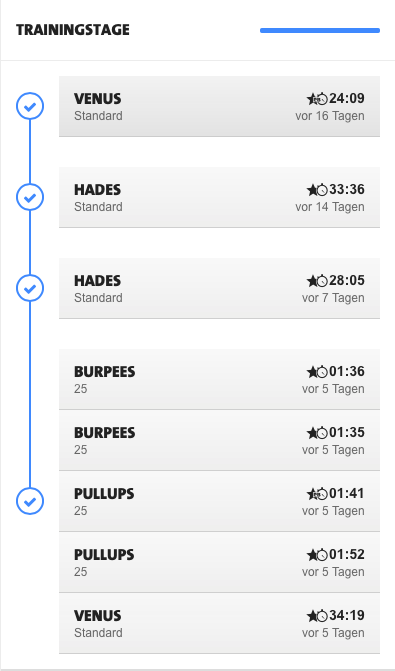 If you do freeletics for a couple of time, your body starts to (kind of) require it. When I took a longer break (around 5 days) on Dominica, I started to sleep bad – even though I felt more tired in the evening and I started to feel uncomfortable. This trip was a great experience and I made a lot of valuable memories. Now I am at home, started to work again – and it is strange how your everyday life just continues like on the day you left. I thought back now and then this week, when I had a rough day at work – remembering the sun and sweat on my skin, the sand between my toes and the fresh ocean – nothing to do for the day, except finding a nice beach to spent some hours. For a short time after a vacation you can live on memories like that, but they already started to fade away and – I am sure – in a couple of months I will almost have forgotten the beautiful beaches, the sound and smell of the rainforest, how it felt to take a bath in a clear, fresh river after a long hike and the unhurried mentality of the people. This week I was on the beautiful island of Guadeloupe in the caribbean sea with 3 of my friends. I decided to continue with my workout plan, although it might be challenging to to integrate the exercises in our travel plans. But I have to say, it was easier than I thought. I tried to do the workouts in the morning or in the evening when the sun was not that aggressive and my friends where still sleeping. One of them is quite sportive too and he joined me for some of the exercises – but as everybody who is new to freeletics he could barely complete a workout. One of the best things about freeletics is, that you can do it almost everywhere. The only thing that was sometimes hard to find, was a place to do the pull-ups. There are many possibilities like trees, bars on buildings or walls. Keep your eyes open and be creative. Apart from this exercises I did a lot of other activities like hiking, swimming, running and other exercises with my friends on the beach. So from that point of view it was no problem to continue my workout routine. The only bigger problem I experienced was with nutrition. As Guadeloupe is a small tropical island with not much industry much of the food has to be imported and is accordingly expensive. I ate a lot of chicken to get the amount of protein I usually take, but being with 3 other people all the time made it hard to always get my “special treatment” regarding the nutrition. If everybody wants to eat hamburgers for dinner and there is no alternative around, you have to defer to the majority. Also rum is cheap in the caribbean and on your vacation you always want some fun too. But fortunately fresh fruits are cheap here, so the recovering from hangovers and the vitamin input is no problem. I was far away from beating my PBs this week but at least I completed all the workouts.